Human rights law and the legal protection of women from violence are still fairly new concepts. As a result, substantial discrepancies exist between what is decided in the halls of the United Nations and what women experience on a daily basis in their communities. 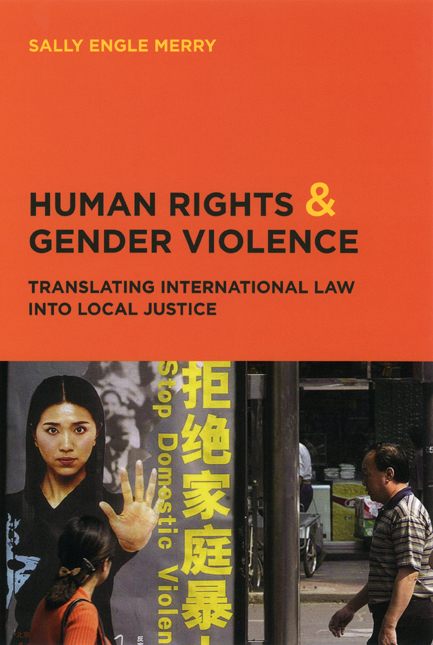 Human Rights and Gender Violence is an ambitious study that investigates the tensions between global law and local justice. As an observer of UN diplomatic negotiations as well as the workings of grassroots feminist organizations in several countries, Sally Engle Merry offers an insider’s perspective on how human rights law holds authorities accountable for the protection of citizens even while reinforcing and expanding state power. Providing legal and anthropological perspectives, Merry contends that human rights law must be framed in local terms to be accepted and effective in altering existing social hierarchies. Gender violence in particular, she argues, is rooted in deep cultural and religious beliefs, so change is often vehemently resisted by the communities perpetrating the acts of aggression. A much-needed exploration of how local cultures appropriate and enact international human rights law, this book will be of enormous value to students of gender studies and anthropology alike. "Merry provides an excellent model of how to conduct multi-sited fieldwork in a deterritorialized world, demonstrating how ethnography permits engagement with the fragments of a larger global system. . . . Wonderfully clear and engaging writing." "A book that should be read by every sociologist interested in globalization, international law, or human rights." "Merry does an invaluable service by marrying a broad methodological prescription for the analysis of human rights issues to a multi-layered discussion of diverse, compelling cases. Indeed, Merry’s lucid writing, diverse tiers of analysis and insightful case studies ensure that this book is appropriate for both scholars and undergraduates with even a passing interest in human rights, ethnography or contemporary women’s activism. In the end, the book provides a forcefull call to enlist the nuanced tools of cultural anthropologists and others familiar with non-western law and politics in the service of a spirited defense of the continued political vitality and impact of universal rights law." "A valuable contribution to our thinking about international human rights, both because it examines in empirical detail the interaction between the transnational culture of human rights and alternative cultural discourses in specific contexts and because it acts as a corrective to oversimplified assumptions about the meaning of international human rights and the meaning of culture."